VietNamNet Bridge – New Year's eve this year – the Year of the Dragon, bears a special significance because the dragon is the symbol of power and prosperity according to the Asian people. At the moment of New Year's eve, people do not forget to offer best wishes to families, friends and hopes for a new year with good fortune and prosperity coming to them. Tens of thousands of people flocked to Hoan Kiem Lake in downtown Ha Noi to watch the fireworks display during the first minutes of the new Lunar Year on January 23. Even the chilly air at midnight seemed to heat up with the crowds of pedestrians and vehicles. While firework displays were set off at 29 sites throughout the city, it seemed everyone wanted to go to Hoan Kiem Lake, where artistic performances were held on several outdoor stages. After the fireworks, the flow of people began to disperse, bringing an air of excitement to even the narrowest alleys. 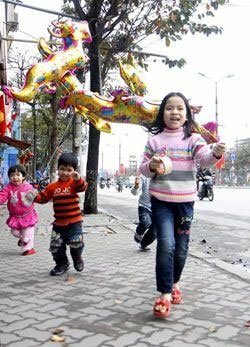 In Ho Chi Minh City, New Year's eve was also the third day of the Nguyen Hue flower street festival, which welcomed a large number of tourists, both domestic and foreign people. Joao Vat, a Portuguse tourist, said he saw that all people are happy in these new year days. They came here to welcome the moment of entering a new year. Like Hanoi, watching fireworks was a popular activity, with people flocking to Thu Thiem tunnel, causing congestion in all streets to the area. Le Hoai Oanh from Tan Phu District said she wished all her family members good health and good study.